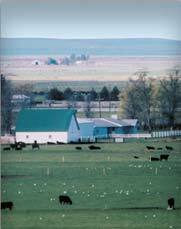 Welcome to Meadow Acres Angus Ranch located in the Columbia Basin region of Oregon near Echo, Oregon. The ranch is located approximately 11 miles south of Hermiston and 22 miles west of Pendleton in the beautiful Echo Meadows. 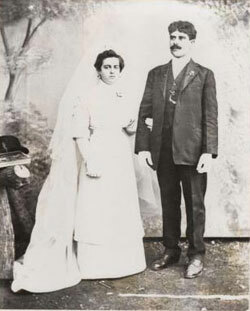 Argentine and Jess Correa Sr.
Jess Correa Sr. (first generation) came from Portugal to the United States and worked for the historic Joseph Cunha Ranch. In 1911, he and his wife Argentine purchased the home ranch in the Echo Meadows from Colonel Roy Raley of Pendleton. Jess Sr. started out with 6 milk cows and some sheep. Each year would bring new challenges for the both of them. They would sell the cream from the cows and the calves each year for their income. The exciting time of the year for Argentine was the sale of the calves in Portland. She would always get a new coat for Christmas after the sale. In 1949 Jess Jr. (second generation) and his wife Cecilia began running the operation and did so until 1976, when his middle son Richard (Skeeter) Correa (third generation) started managing the operation. Cecilia Correa, 92, lives on the ranch to this day. Richard Correa and his youngest son Devin (fourth generation) run the day-to-day operations now. Devin and his wife Melanie have two sons Gage (13) and Garrett (16). 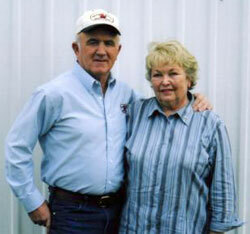 They are the fifth generation and are already involved with the cattle and haying operations. Meadow Acres presently runs 200 registered Angus cows. The registered herd consists of a very maternal set of foundation cows purchased from the Joe VanNice Ranch in Silver Star, Montana. The VanNice herd bull battery consisted of SAF Fame, SAF Connection, and SydGen Eclipse. Other cows came to us from these outstanding programs: Thomas Angus, Baker City, Oregon; Jay Leachman Angus, Bozeman, Montana; Gardiner Angus, Ashland, Kansas; O & M Inc., Prineville, Oregon; Shadybrook Farms, Tennessee; Beartooth Ranch, Columbus Montana; and VanDyke Angus, Manhattan, Montana. The registered cows are all Artificially Inseminated (AI) to the top sires in the country and the commercial cows, which are mainly out of our registered cows, are utilized as recipients in our Embryo Transplant (ET) program. Meadow Acres will begin to use cooperator herds in the spring of 2006 to carry embryos. The use of AI and ET guarantees exceptional maternal traits in our females along with tremendous genetic power in the bulls. Meadow Acres also follows a very strict herd health program. Every animal born at the ranch is B.V.D. ear notch tested, guaranteeing all animals to be B.V.D. free. The females are all bangs tagged and are also vaccinated with Bovishield Gold. Each female also receives Scour-bos 9, 8-way, Multimin, and Ivomec pour on each season. We take pride in having a healthy, clean, well respected herd. Customers can rest assured that cattle purchased at Meadow Acres have been on a strict herd health program. A goal of Meadow Acres is to pass along these genetics to our valued customers so in return they can generate more profit from their offspring. The cows start calving October 15 with heifers beginning on October 1 and Coop Receipts begin calving September 10. Calving at this time allows us to provide more mature bulls and females by sale time in the middle of February. The Meadow Acres philosophy is simple: provide high-quality genetics at prices everyone can afford. We believe in a sound, balanced, comprehensive program for the breeding, management, and marketing of superior black Angus cattle. The program is being built to increase desirable traits such as calving ease, early maturity, fertility and mothering ability. The heifers, three year olds, and cows are winter fed hay and haylage and calves are not creep fed throughout the growing season. This allows us to look at real world results, not man made results. At Meadow Acres, we only select proven AI sires along with legendary Pathfinder sires to base this cow herd for consistency. We select sires that have balance and uniformity, not certain single traits. There is no such thing as the perfect bull or cow, but if you choose wisely on your sires, we will certainly help shorten the gap. Our cows must be excellent mothers with plenty of milk production and be able to breed back on time. The cows that don’t meet this criterion are removed from the herd.